But what are we going to eat? Long gone are the days of a pie or a scone and a cup of tea on proper thick railway china with the faded monogram of the train company stamped proudly on each piece. Well from everywhere except Downton Abbey anyway. We were heading off rather early on a train journey to the land of beer, chocolate and diamonds with a friend who shall remain nameless (Lizzie). So early in fact that it meant breakfast was not going to be possible at home. I felt quite safe heading off without food as most railway stations nowadays are full of all manner of places offering a quick gobble and go opportunity before running for your train, or a range of pre-packed food and beverages to take on the train, to be consumed at your leisure. First stop was a coffee shop on the station concourse. I was rather happy when I found these lovely looking pastries. The taste panel first rejected the coffee as bitter and the pastries didn't fair much better. Crisp, light, and flaky with a melt in your mouth butteriness they so were not!! Ok so this wasn't France, but just as well as they would likely have thrown whomever baked these into the Bastille, and made them eat their own cooking until they were suitably rehabilitated and changed jobs. In this instance a brick layer would have been a good choice, as they could have made their own materials!! Never mind Ted there's always the food on the train said Lizzie. The train had barely left the station when I made a rush for the buffet car. There was no granola and yoghurt, but I could have had Moroccan tagine, Bloody Mary, Champagne, crisps or something that looked like a long life muffin, that was now entitled to draw a pension. 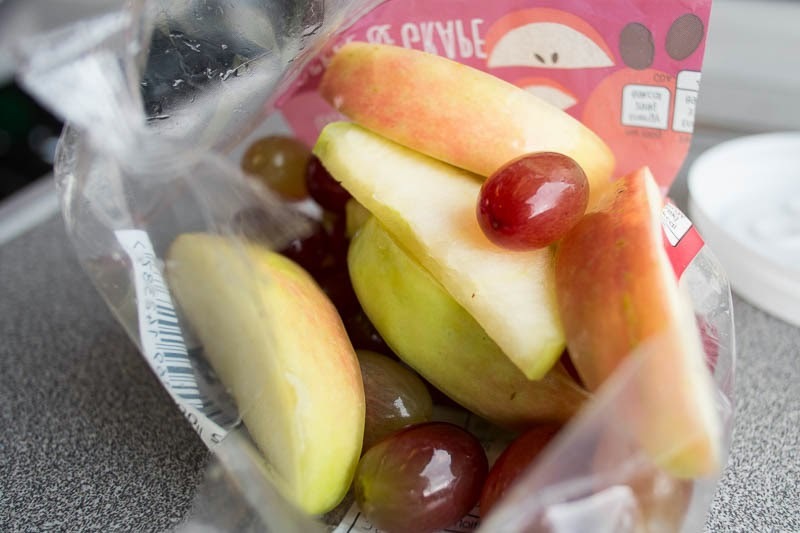 I chose little fruit pack of apples and grapes that were all nicely pre-sliced for me and tasted like well... apple slices with grapes. 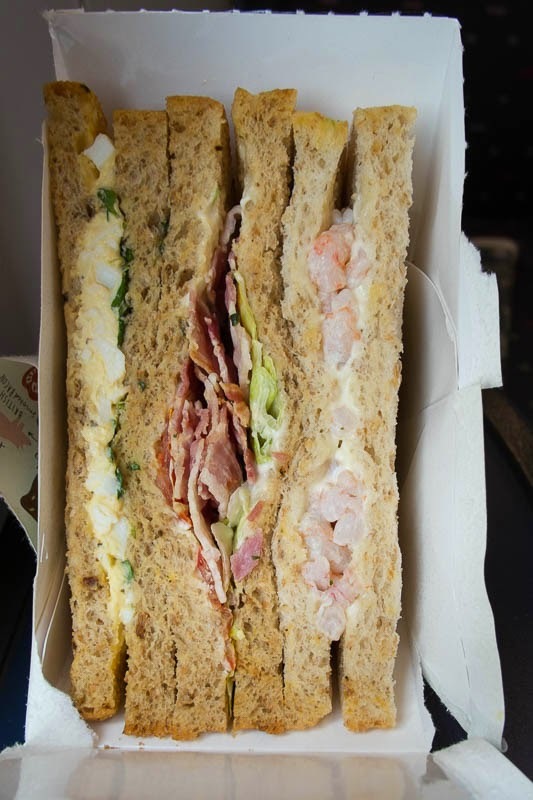 The only other thing that vaguely appealed was a sandwich trio pack of english favourites - egg & cress, bacon & lettuce, and prawns & mayonnaise. Not that I imagine the Earl of Sandwich had anything even vaguely like that between the two pieces of bread his manservant returned with when sent away with instructions to come back with some form of nourishment that he could manage to eat with one hand while continuing to play cards and gamble away the family fortune with the other hand. So all in all how was it Ted ... my advice is to either take a home made picnic on the train or pretend that crisps are actually grown up cornflakes and feel no guilt. After all ... you got up soooo early to catch this train. A quick look through the posts reminds me to mention 'Weight Watchers' for some reason. I will try out an English breakfast soon. This looks nice. I'd still have gone for the pastries... though an egg sandwich is something I haven't had in awhile. That is an experience that I find so familiar. After spending too much time in airports this past weekend, I can attest that they are not doing any better than the train stations.